"A sweet but spicy BBQ Sauce. Just thick enough to slab on any meat over the grill or in the oven. The whole family enjoyed the stickiness and flavor. Brush sauce onto meat of your choice. Sweet, but a touch of hotness, too. I found this to be very enjoyable on ribs. Was able to do a 8-rib rack, but it can do another one; I just like it thick. This would be enough for 12 chicken quarters. Very easy." Stir hot pepper jelly, ketchup, white vinegar, Worcestershire sauce, mustard, and garlic together in a saucepan; bring to a boil and remove from heat. Cool. A quick recipe that can be used as a marinade, basting sauce, and table sauce. 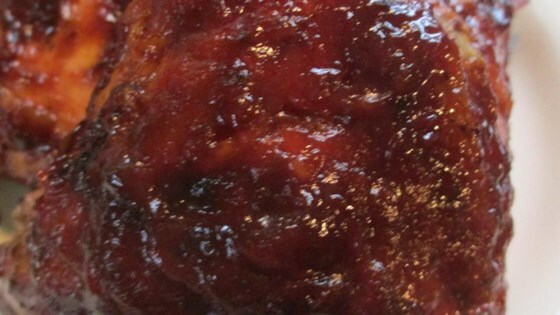 I was very pleased with the outcome of this sweet and spicy BBQ sauce. I used this for chicken thighs and took the suggestion of AuntE and added minced peaches and extra hot sauce. Stuck to chicken as it basted on and had a wonderful taste.